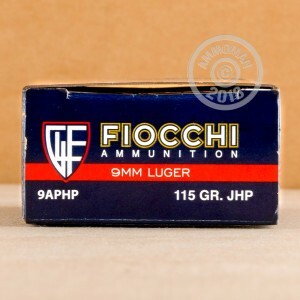 This 9mm Luger ammunition from Fiocchi is a great choice for target shooting and "just in case" preparation. Each cartridge in this volume priced case of 1,000 fires a light 115 grain jacketed hollow point bullet. As a standard pressure load, this ammo works well in both subcompact and full size firearms and produces mild recoil. 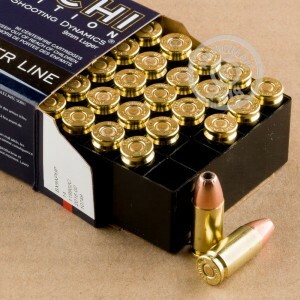 Fiocchi ammo sold in the US is primarily made in Ozark, Missouri using non-corrosive Boxer primers and brass cases. Place an order for $99 or more (this case qualifies automatically) and get free shipping from AmmoMan.com! Great practice ammo for a great price. Arrived quickly after I ordered, and all the ammo looks great and has worked perfectly. Fed reliably. Regular extraction and ejection. No failure to fire. Very accurate ammo in H&K P30SK. No problem with the first two hundred rounds. The hollow point is small and I suspect it does little to expand. Certainly great range ammo. Confidence that hollow points feed and eject reliably. Two days after order was placed it was delivered. Visual inspection revealed a top grade product manfactured with pride and excellemce.. Tomorrow is range day,looking to run several boxes down range with my Legion P226.My Ruger P89's also need ranger time. Great looking ammo.